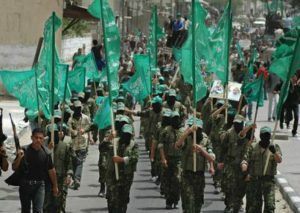 WASHINGTON — Hamas, the once-proud and powerful terrorist organization for Palestinians, has fallen on hard times. Reuters reports that ever since they gained control of the Gaza Strip and isolated themselves from historical allies Iran, Hezbollah and Egypt, their finances have suffered. Hamas had allied itself with the Islamist and Sunni Muslim political party in Egypt, the Muslim Brotherhood, and were elated when they won the Egyptian presidency and had a majority in the country’s parliament. However, their leader Mohammed Morsi quickly became unpopular by way of power-grabbing decrees and imprisoning opposition bloggers and led to the military dethroning Morsi from power. The Syrian civil war also led to Hamas’ split with Shi’a Muslim Iran and Hezbollah, who entered the war on the side of the President Bashar al-Assad. Hamas’ move enraged Iran and Hezbollah (which Iran funds) and led to a quick withdrawal of financial support. Now, Hamas is more alone than ever. And, with current negotiations between Palestinians and Israel at a standstill, Hamas needs more allies and more funding.